Walking Battery Powered Electric Straddle Stacker For 36" Pallets. 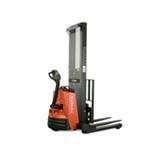 Manual Steering Electric Pallet Jack That Stacks/Loads Up To 128". Work Cycle Approx 8 hrs Battery Charger Mounted on Unit. Load Capacity @24" Center Is 2500lbs or 2000lbs @24" to 128" High. Free Lift To 42" Max Lift Height 128" Lowered Mast Height 84"
* Please call us for any questions on our forklift pallet stacker electric walkie rentals in Portland OR, Gresham OR, Milwaukee OR, and surrounding metro area.